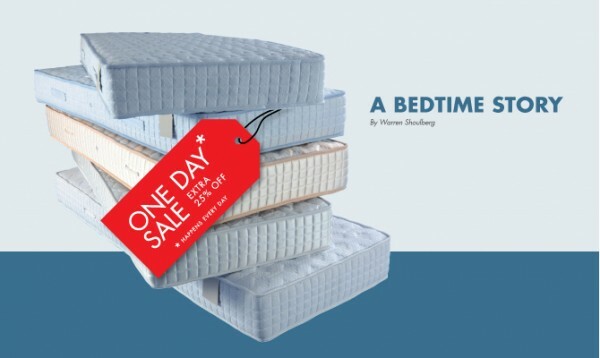 A BED TIME STORY by Warren Shoulberg – EasyPay Finance Today! I wanted to share this post because as a small business owner, our company too gets lost in all the paper ads the big stores slam out there to make it seem as though your getting the best deal, but the truth in the story is that we as a small business have to compete with the big stores so to get the edge we hand select a better quality product, a lower profit margin and stand tall when it comes to service. We love what we do and the friends we meet is the reason we have almost 40,000 fans on Facebook within 150 miles. Thank you, enjoy the story! It was a holiday weekend and just like clockwork, it arrived in my mailbox: The latest circular from Macy’s, advertising a mattress sale. Didn’t matter if it was Columbus Day, Labor Day or St. Swithen’s Day, there was a mattress sale going on at the big store. Has there been a national, religious or cultural holiday in the last 50 years in which there was not a mattress sale? And was that Princess with the pea the last person on earth to actually pay full price for a mattress? There really is no consumer product quite like a mattress. We spend a third of our life – give or take a few late-night indulgences – on a mattress, yet we know very little about what’s actually in the darn thing. It’s one of the more expensive purchases we make, yet most of us don’t have a clue about how to buy one, much less where to go to do so. And with good reason: We don’t get a lot of practice. We get a new car every three to five years. Many of us, at least until recently, moved and bought a new house every decade or so. Even a washing machine only lasts nine or ten years at best. But mattress life spans go on and on and on. Some people can put 20 years on a mattress. Some parents recycle the twin mattress they used as a kid for their kids. Some go from adolescence to Alzheimer’s on the same mattress. It takes a very long time for a mattress to wear out. It’s not that retailers are doing anything bad. It’s just the nature of the beast. Consider the mattress: Other than consumer electronics products, it’s the only product out there that’s a total unknown, a sealed bag. You have no idea what’s in there. At least with a DVD player, there are some tech specs you can use to judge products. Mattresses? Coil density just doesn’t cut it. The nomenclature of mattresses seems to have been created by a committee composed of Rube Goldberg, Professor Irwin Corey and every member of the United States Congress. Look at the sizes: Twin, full, queen and king (not to mention California King, as if that state houses a colony of mutant giants). Talk about your mixed metaphors. Twin of who? Full of what? Who you calling a queen? Look at the labels: In what lexicon is “firm” the softest level of product? Is super firm more firm or less firm than extra firm? And then there’s the whole buying experience. When you go to buy a shirt, you can try it on. Towels? You can rub it across your cheek. You can compare the pictures of flat-panel TVs, even if most stores seem to be tuning the pictures to suit their sales quotas. But a mattress? You awkwardly lie down on it for a 30 or 40 seconds. Maybe you get your significant other to do the same on the other side. But you’re really not comfortable getting into the fetal position and dozing off. You can’t prop yourself up and eat take-out Chinese food. There’s no TV at the foot of the bed to watch. And as for that other popular bedtime activity, there’s no way you’re going to get the store to turn down the lights and crank up the Barry White so you can assume the position. All of which gives most retailers the upper end in this particular buying equation, a position they are increasingly unaccustomed to. Most people buy a mattress in one of three places: A mattress specialty chain, like Mattress Firm or Sleepy’s; a furniture store, like Raymour & Flanigan or Rooms To Go; or a department store. The warehouse clubs do sell mattresses, but not in the same numbers they move other products. The internet has not really been a factor in mattress sales, the consumer wanting even those 40 seconds of hands-on product interaction to make their purchasing decision. It’s not a product category the discount stores excel in either. It’s big, bulky and has to be delivered, all things mass retailers hate. Some, like Walmart, have tried to sell mattresses over the years with varying degrees of failure. Department stores also hate big, bulky products that have to be delivered but for some reason they continue to be very successful in the mattress business. Wow, did she really actually say that? The store you can trust? Wow. The implication is subtle, but brilliant. But wait, Macy’s says you can trust them. Can you trust them telling you that you can trust them? Like any good ad campaign, if you say it often enough, slow enough and loud enough, people will believe anything you say. It does seem to be working. Solid numbers are hard to come by, but Macy’s probably sells more than a half a billion dollars worth of mattresses every year. Not bad for something you can’t giftwrap. Curiously, the Macy’s campaign goes back to the very roots of the modern American department store. When John Wanamaker and his cohorts first created the original department stores, a big part of the merchandising and marketing strategy was that you could be guaranteed you would pay the same price everyone else did. No haggling, no double-dealing, no bastards. Could a store like Macy’s call upon those roots and embrace this whole trust thing throughout the store? Could this be the true savior for the great American department store and make Terry Lundgren the ultimate poster boy for retailing? Can a shopper really trust a retailer? Let me sleep on it and get back to you. Warren Shoulberg is editorial director for several Sandow Media home furnishings business publications and working on his next book, Stupid Business. He bought a new mattress a few years ago…at Macy’s of all places…but he’s still not sure he trusts them.